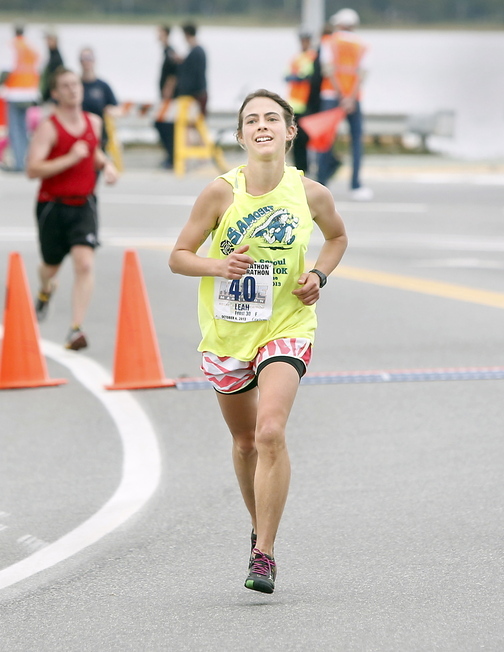 PORTLAND — Rob Gomez of Saco and Leah Frost of Round Pound won the 22nd running of the Maine Marathon on a cool and cloudy Sunday morning. 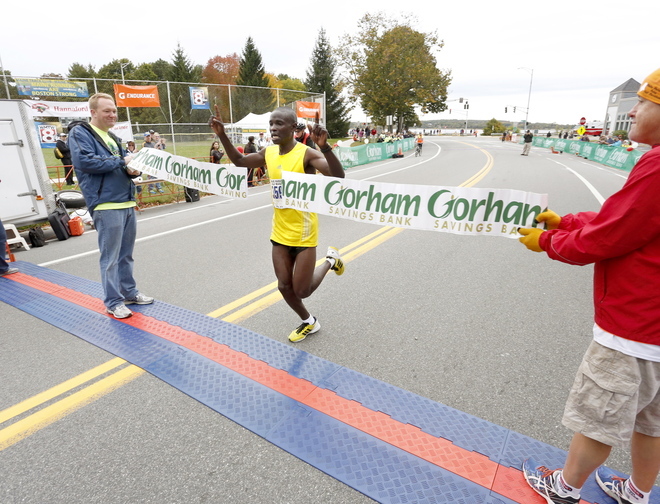 Gomez, 30, ran away from the field of 1,162 to win by more than 10 minutes in 2 hours, 24 minutes, 22 seconds. The victory was worth $500 plus a $1,000 bonus for breaking 2:25. 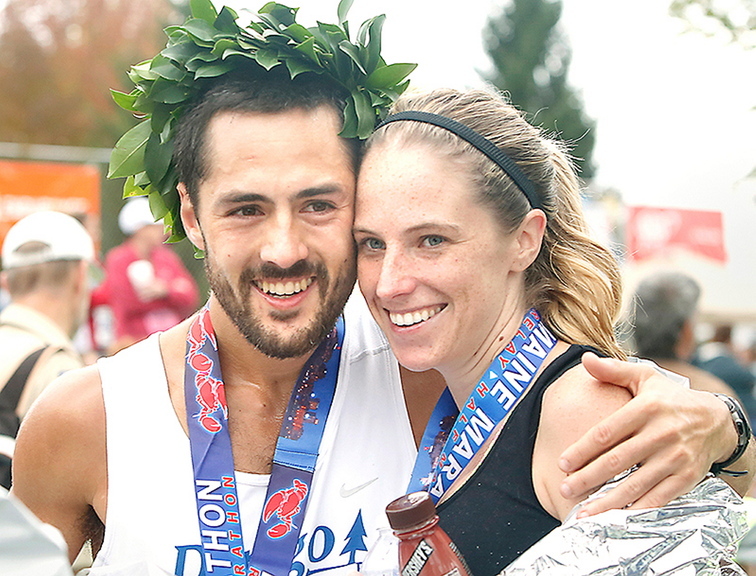 Tim Greenway/Staff Photographer Rob Gomez of Saco receives a hug from his girlfriend, Breagh MacAulay, after winning the Maine Marathon Sunday in a time of 2 hours, 24 minutes and 21 seconds in Portland. 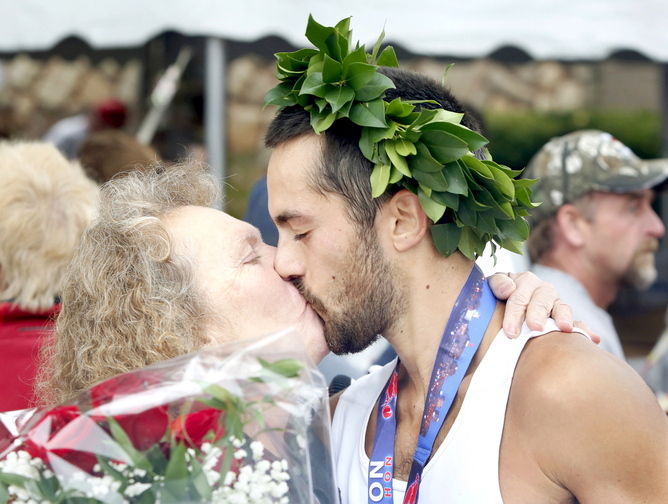 Photos by Tim Greenway/Staff Photographer Rob Gomez of Saco receives a congratulations kiss from his mother Connie after winning the Maine Marathon Sunday in a time of 2 hours, 24 minutes and 21 seconds in Portland on October 6, 2013. Half-marathon winner Moninda Marube, 34, of Auburn crosses the finish line after winning the Maine half-marathon on Sunday in Portland. Maine half-marathon winner Sarah Mulcahy, 28, of Baring Plantation approaches the finish line Sunday in Portland. Woman’s marathon winner Leah Frost of Round Pound approaches the finish line Sunday in Portland. A year ago, Gomez was runner-up to his friend Dan Vassallo of Peabody, Mass. A Colby College graduate, Vassallo had been invited by Gomez to run the race and wound up with a course-record time of 2:21:12. Adam Goode, 30, of Bangor was second in 2:34:48 and Matt Rand, 22, of Cape Elizabeth was third in 2:35:14. 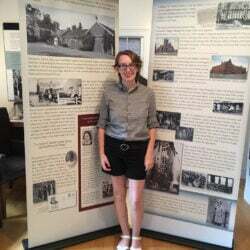 Frost, 30, grew up in Round Pound, attended high school in Switzerland and ran one season on the Wesleyan University cross country team. Her only previous marathon experience had been as a bandit, or unregistered runner. She won Sunday’s race by more than 3 minutes in 3:00:52. Erin Nixon, 24, of Boston was second in 3:04:06 and Dana Deingenis, 28, of Norwood, Mass., was third in 3:08:15 — edging fourth-place Katie McMahon, 19, of Brunswick by 4 seconds. Grant Berthiaume, 51, of Tucson, Ariz., won the wheelchair race in 2:19:59 as part of a trio of men attempting 50 wheelchair marathons in 50 weeks in 50 states. 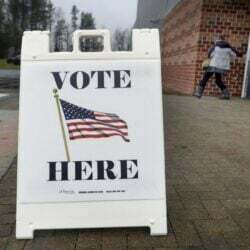 They raced in New Hampshire Saturday before coming to Maine, No. 36 on their list. 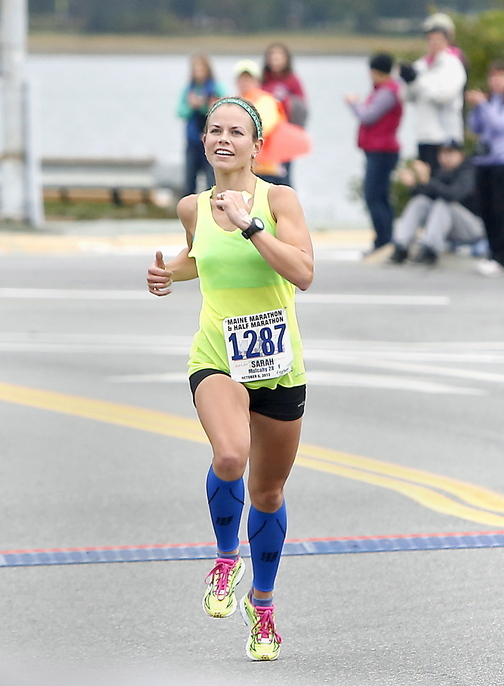 In the concurrent half marathon, Moninda Marube, 34, of Auburn won by more than 2 minutes in 1:08:13. The first female was Sarah Mulcahy, 26, of Baring Plantation in 1:23:42. The half marathon included 2,407 entrants. For the second year in a row, the race beneficiary, STRIVE, will receive a check for more than $50,000 from race proceeds. Find searchable real-time results here.